VADA CURRY RECIPE - This dish is a wonderful all rounder that goes well with Idli, Dosa or Poori's. It is prepared by making vadai using chana dal and cooking them in an onion-tomato based gravy. 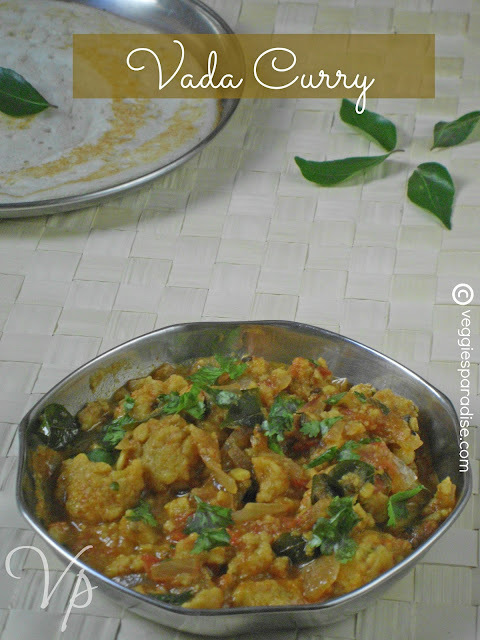 In a blender,add all the ingredients needed for preparing vadai and grind to a coarse paste. Shape them into balls and steam cook it . Alternatively you can also deep fry these balls. Heat 1 tbsp. of oil in a heavy bottomed pan. Add the spices to the pan, fry for a minute. Add the coriander leaves , mint leaves and green chillies, fry for a minute. Add the onion ,fry until soft. Add the ginger-garlic paste , tomatoes along with the spice powders and fry for a couple of minutes. Add water along with salt , when it starts boiling add the cooked vada's into it . Reduce the flame and cook until the raw smell goes off and the gravy thickens . Serve it hot with Idli's, Dosa's or Poori sprinkled with fresh coriander leaves. Yes this will go so well with hot pooris. Yumm! Very flavorful and delicious vada curry. Tempting and delicious curry.. Love to have it with dosa.. Happy to follow you..visit me when time permits.. Such a traditional and comforting recipe. Love vada curry with soft idlies,makes me hungry here. 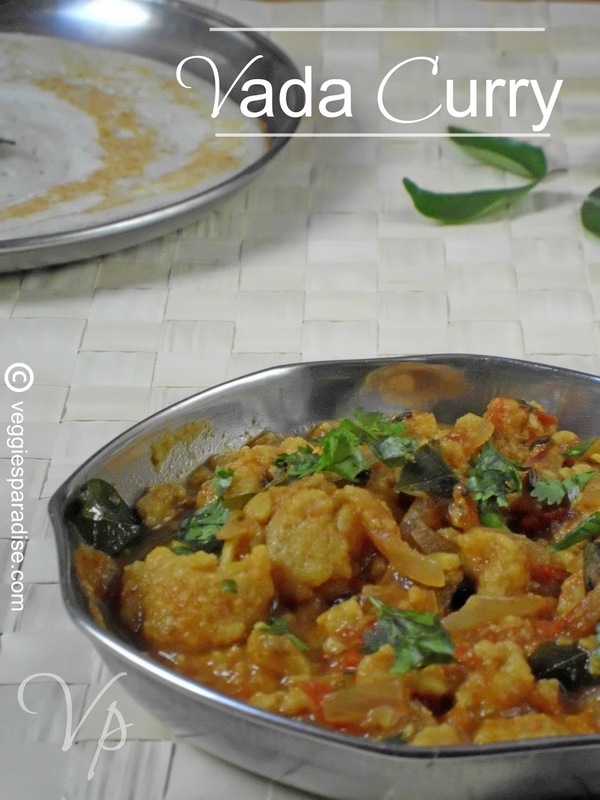 Nice delicious curry with tasty flavors! !